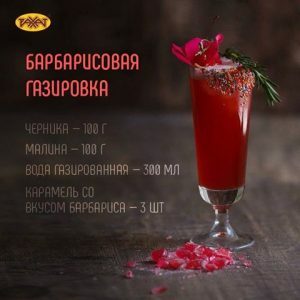 In this summer heat we share with you the recipe of a delicious soft drink based on caramel with taste of barberry! 1) Fill any pan with berries, pour boiled water and put into the freezer until it freezes. 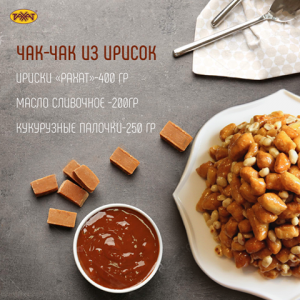 2) Melt the caramel with the taste of barberry (3 pcs.) in a microwave oven or bakeoven and mix with 1 tablespoon of water. 3) Mix the syrup, the cooled carbonated water and the frozen berries together. 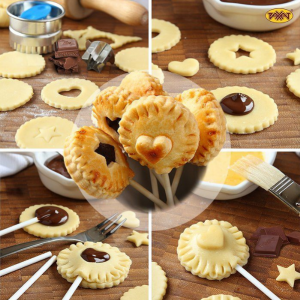 The original cookie on a stick with a chocolate filling will be an excellent decoration for any table. In a bowl, mix the flour and salt, add the oil and grated to the oil crumb. Add the water and knead the dough. Put the dough in the fridge for 2 hours. Roll out the dough, cut out a glass or molds circles. Half the circles are laid out chocolate, melted in a microwave or on a water bath. Put wooden sticks in the middle of the circle. Grease the circles around the edges with a beaten egg. Cover with another circle, in the center of which you can cut out a heart or an asterisk. Pinch the edges by fork. Grease the cookies with beaten egg, sugarcoat if desired. Bake the biscuits at 200 degrees for 25 minutes until golden. 1) Melt the dark chocolate and butter in the saucepan, stirring with a spatula over medium heat. 2) Combine flour, sugar, cocoa, eggs, vanilla extract and a mixture of ginger and nutmeg in a bowl. 3) When the chocolate and butter mixture will be ready, pour the hot mass and mix the dough well until smooth. 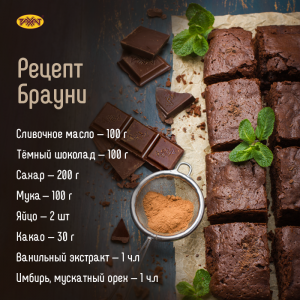 4) Spread the parchment on the bottom and the walls of the pan, in which you will bake brownies. Put the dough and level with a spatula, bake at 160 degrees for 30 minutes. Have you ever thought that from toffee and corn sticks you can cook a real chuck chak? 2) Pour corn sticks in a container. 3) Fill the sticks with resulting toffee and mix them thoroughly. Ready! Lay out the “lazy” chak-chak on a plate and it can be served to the table! 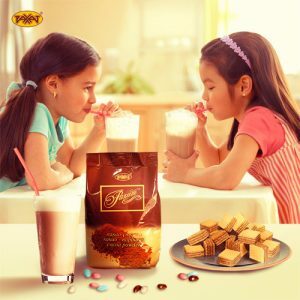 The most favorite delicacy of all children and adults is, of course, ice cream! While the weather allows us, we would like to share with you a delicious recipe for ice cream from marshmallow! 4) Pour the resulting mass into molds and place in the freezer. 1) Cocoa preparing procedure: for one cup (200 g) of the drink one should take 1-2 tea-spoons cocoa- powder and mix up with 2-3 tea- spoons of sugar. 2) The prepared mix should be diluted by an element of hot milk. 3) Then one should add the remaining milk to the acquired mass and bring it to the boil. .